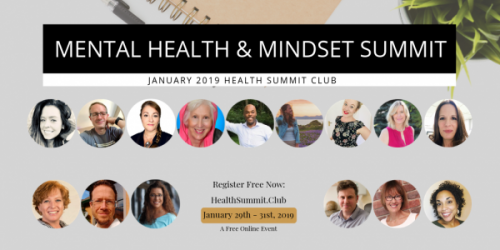 Health Summit Club, organizer of the new January 2019 Mental Health & Mindset Virtual Summit, announced their Mental Health & Mindset Virtual Summit event will be held from January 29 - 31, 2019. Anyone struggling with their mental wellness and looking for the latest information on mental health & mindset can register to attend January 2019 Mental Health & Mindset Virtual Summit scheduled for January 29 – 31, 2019. Turning Resolutions Into Habits – Sandra Miller walks us through specific steps and mindset techniques that will help us understand why we haven’t followed through with our resolutions in the past, and break that habit in favour of a new one – following through on all our commitments to ourselves. Ups, Downs and Middle Ground – Surviving Bipolar Disorder – Brandi Blouch has not only found a way to cope with her bipolar disorder, but she thrives and lives a full and rich life. As a health coach, she’s able to support and guide others with this disorder through their toughest times, and encourage them to find the joys in every moment. Transform Anxiety Naturally – Donovan Giraud has experienced severe anxiety throughout his life, among other mental health difficulties. His journey lead him to discover the power behind nutrition, managing your lifestyle, and energy healing. He shares his experience with others searching for ways to naturally heal their anxiety and other mental health disorders. Full details on the event can be found on the company website at https://healthsummit.club. The Health Summit Club website has full details about the sessions at this year’s event. Interested parties can visit the website and register for their free ticket at: https://healthsummit.club.